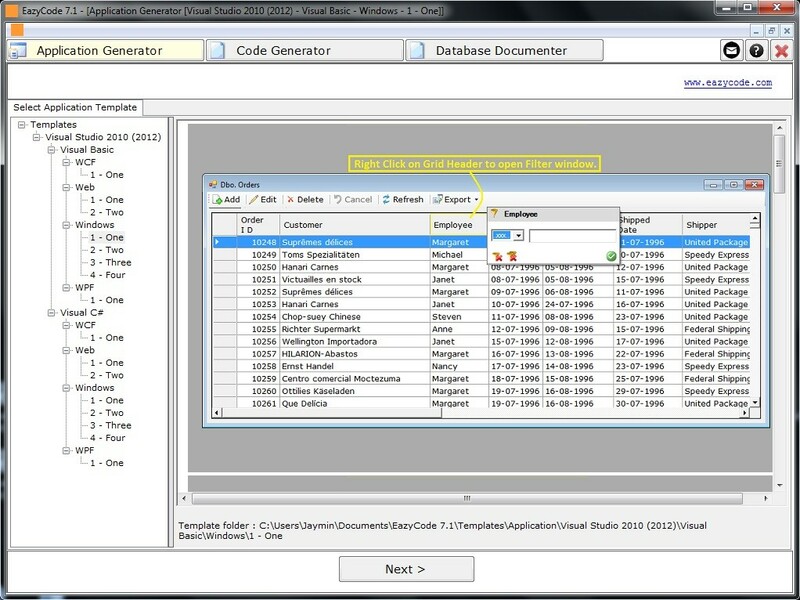 EazyCode is a Rapid Application Development tool (Data-Entry Forms Wizard) that automatically generates windows, web and mobile GUI Code from database table structure and sets of rules. Generated Code works for VS.NET 2010, 2012 and 2013. Generates WCF, Web, Windows and WPF applications in VB.NET and C# (Visual Studio 2010, 2012 and 2013) to search, sort, edit, delete and add data in SQL Server (2005, 2008, 2012 and 2014) databases. Generates Business Layer and Data Layer in VB.NET and C#. Generates SQL Statements and SQL Stored-Procedures to add, edit and delete data in SQL Server (2005, 2008, 2012 and 2014) databases. Generates documentation of SQL Server (2005, 2008, 2012 and 2014) databases in MS Word.